A new tool helps social workers understand clients’ relationship with technology and includes a component for social workers to self-assess technology use in their practice. 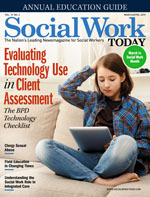 “What we didn’t know when we started the checklist almost three years ago was that it would help social workers in practice and education directly meet one of NASW Standards for Technology in Social Work Practice—the standard on assessing client’s relationship with technology (2.05),” Sage says. “Also, the questions on the checklist can help social workers engage in ethical practice in the use of technology with clients noted in the recent changes to the NASW Code of Ethics, such as assessing for cultural or socioeconomic differences that may influence when, how, and why clients use technology in their daily lives.” The checklist is divided into seven unique sections that include numerous questions, and each section will be detailed in this article. The directions to the checklist note that it is not meant to be a comprehensive tool, and a social worker can use any or all of these questions, in whatever order works best, when conducting an assessment on the use of technology. The overall purpose of the checklist is to help social workers and other practitioners focus on practical issues of technology use across client systems and life span issues. When using the checklist, social workers are encouraged to assess for strengths and needs as well as risks and challenges with technology use. The first section of the checklist addresses client access to social and digital technology. Accessing means the opportunities clients have to use or engage with technology in their daily lives. In an extremely social and digital society, it is important to access technology in order to stay current with day-to-day operations of the world. Resources for many agencies and organizations have been routed to the cyber world through websites, e-mails, newsletters, and more. For example, in the case of online applications, these resources provide access to benefits for employment, housing, and health care, all of which are important and help to ensure basic needs are being met for individuals and families. Currently, job applications are available online as well as the first interview using a video platform. It is likely that an individual who does not have access to social and/or digital technology will not have the opportunity to apply for a job, disempowering the individual and/or family to meet basic needs. One of the goals of a social worker in using the checklist is to determine the types of devices, software, and internet access available to a client or family. Questions in this section focus on the different types of hardware and software available to a client, information about ownership of and access to the technology, when and how the technology is used by the client, and the financial costs associated with the technology. Understanding clients’ access to technology will help a social worker better serve clients, from making reasonable requests to access online resources to helping them determine how they might improve their access to technology. The next section of the checklist covers comfort and digital literacy and focuses on assessing a client’s level of knowledge and skills about technology as well as comfort level. Digital literacy is essential in today’s society given such trends as the growth of fake news and increased risk of identity theft. Questions in this section focus on assessing whether technology has created benefits or challenges for clients based on their use as well as understanding how a client might use technology to keep up with the news or educate themselves about a health care issue. When clients are willing and comfortable to use technology, they have the ability to quickly and conveniently find resources and services that are available online. For example, smartphones have become largely used among all populations including youths and older adults. Therefore, social workers are encouraged to assist clients with mobile devices because they function like computers. Knowing the client’s skill level with a device allows a social worker to walk them through basic steps to use a mobile, such as powering up the phone, adding contacts, using the text messaging functions, and accessing the web. Clients who have the social worker’s support with using technology will develop a sufficient comfort level to navigate systems that can increase quality of life. Questions related to cultural and intergenerational issues are included in the fourth section of the checklist with topics ranging from communication preferences based on age to the influence of culture on technology use. Generally, social workers should be asking questions about how culture may be affecting clients’ technology use. For example, for a family who recently emigrated from another country, do the children know more about technology than the parents, and how? Upon assessing an immigrant family’s technology use, the social worker might discover that the parents need more information about Facebook and how their children might be using the platform. Another area for questions about technology use includes end-of-life issues. In her podcast on “Death and Grief in the Digital Age” with Jonathan Singer, PhD, LCSW, from the Social Work Podcast, Carla Sofka, PhD, MSW, a professor at Siena College and one of the contributors to the checklist, suggests that social workers should routinely ask questions about technology with older adults to help establish digital advance directives. Finally, the Pew Research Center, a nonpartisan organization that tracks technology trends in the United States, notes that individuals who are 65 and older are using social media such as Facebook on a regular basis. Reasons include staying connected with family members, looking at photos, reading the news, and surfing the net, which brings a sense of connectedness. When working with clients of any age, a social worker would benefit by asking how and why are they using technology. This information would assist a social worker with how they could better serve a client and/or resources that are necessary for them based on their technology use. The fifth section of the checklist addresses special populations such as individuals who are experiencing homelessness or live in rural communities. Social workers must be mindful of the unique situations or challenges that relate to technology access depending on location or circumstances. For example, the National Digital Inclusion Alliance reported in 2018 that not only do rural communities have lower rates of broadband connectivity but many inner city neighborhoods also have persistent gaps in internet access. Furthermore, when talking with clients experiencing homelessness, it is important to ask about their devices as well as battery life and Wi-Fi access. Charging a cell phone can be more difficult if the library is the only option, especially if the library limits computer access or is unwelcoming. Other special populations covered in the checklist include foster care youths or clients with developmental disabilities or mental health issues. Finally, this section also offers assessment questions for online education. Both K-12 and higher education have seen an explosion in the use of educational technology from the use of computers in the classroom to entirely online classes delivered through learning management systems. For clients enrolled in school at any level, social workers benefit from asking questions about how technology affects their learning, both the benefits and barriers to technology-mediated learning. Questions for families about technology use compose the sixth section of the checklist. By asking questions about technology during family sessions, a social worker is generally trying to understand how and when technology supports the family and when it creates tension or family conflict. With the proliferation of advice websites and how-to books targeting parents about how to manage technology with children and adolescents, social workers must understand the role that technology plays within a family, not only the challenges but also the benefits. Topic areas for this section of the checklist range from understanding the family norms around technology to the levels of access to technology for all members of the family. For example, does dad have a flip phone while the teenager has smartphone? These questions can be used with all types of families including families in mediation for divorce or conflict situations. In these situations, a social worker would want to learn more about the family’s practices for communicating via technology, and may want to help the family develop a safe and effective communication plan. In high-risk situations, the social worker may want to assess the family’s need for a communication service such as Our Family Wizard, which offers families tools for scheduling, tracking finances, and a message board. By understanding when and how clients use technology, today’s 21st century social workers can better meet clients where they are. In addition to providing probing questions to learn more about a client’s status, experiences, and perspectives, the checklist also provides additional resources for each section and the names and affiliations of all the contributors. Using the checklist offers one tool for social workers to use during the assessment, and, as editors of this checklist, we hope that you will incorporate some of these questions and ideas into your own assessment practice. This tool will help you provide ethical and appropriate care for clients related to their relationship with technology. — Nathalie P. Jones, PhD, MSW, is an assistant professor of social work at Tarleton State University. — Laurel Iverson Hitchcock, PhD, LICSW, is an associate professor of social work at the University of Alabama at Birmingham. Belluomini, E. (2013, December 31). Example of a technology assessment/rubric for use with families [Blog post]. Bridging the Digital Divide in Social Work Practice. Retrieved from https://socialworksdigitaldivide.blogspot.com/2013/12/example-of-technology-assessmentrubric.html?m=0. Hitchcock, L. I., & Jones, N. P. (2018, October 30). BPD Technology Committee’s Technology Assessment Checklist for Social Work Practice [Blog post]. Teaching & Learning in Social Work. Retrieved from https://www.laureliversonhitchcock.org/2018/10/30/bpd-technology-committees-technology-assessment-checklist-for-social-work-practice/. Our Family Wizard. (n.d.). Homepage. Retrieved from https://www.ourfamilywizard.com/. Pew Research Center. (n.d.). Internet & technology. Retrieved from http://www.pewinternet.org/. Singer, J. B. (Producer). (2017, February 19). #109 - Death and grief in the digital age: Interview with Carla Sofka, PhD [Audio podcast]. Social Work Podcast. Retrieved from http://www.socialworkpodcast.com/2017/02/digital-death.html.